It’s been a particularly bad 24 hours in the life of one Paul Manafort. Yesterday, Special Counsel Robert Mueller submitted a report to the VA court overseeing Manafort’s case that the defendant had broken his cooperative plea agreement by lying to prosecutors on a variety of topics of interest to the investigation. This opens Manafort, 69, up to the very real possibility that he will spend the rest of his life in federal prison. Then this morning, The Guardian dropped a bombshell report that Manafort had traveled to London to meet in secret with Wikileaks founder Julian Assange on no less than three different occasions, the most recent of which occurred in March, 2016, just weeks before Manafort would join the Trump campaign, and only months before Wikileaks would publish hacked DNC emails given to them by the Russian GRU, whom had stolen them in the first place. It was accidentally revealed in court filings two weeks ago that Assange has himself been indicted in secret, awaiting his release into UK custody and extradition to the US. Ever since Manafort’s indictment and arrest late last year, it’s been popular among the rightwing blogosphere, media mouthpieces, and online trolls to claim that his multitude of charges have nothing to do with the Trump campaign or Russian collusion. The events of the last couple days lay this deliberate bit of misinformation bare as the lie and propaganda it always was. But to see the thread connecting Manafort, to Russia, and ultimately to Trump personally, we need to back up a bit. The charges Manafort has already either been found guilty of, or outright confessed to as part of his now defunct plea agreement, are related to tax-evasion, money-laundering, and failure to register as a foreign agent under the Foreign Agents Registration Act. It’s true that the specific instances of these crimes predate Manafort’s addition to Trump’s campaign, the earliest of them date back to 2005 or so, but it’s what he was doing, and who he was doing it for that leads inarguably to Trump’s door. Anyway, back to Manafort. Paul worked to rehabilitate the ex-con Yanukovych’s public image in the aftermath of the Orange Revolution and propel the eastern Ukraine based Party or Regions and their pro-Kremlin platform to electoral victory in 2010. A victory they celebrated by jailing their political rivals and sparking yet another revolution in 2014 which saw Yanukovych deposed yet again because some children just keep putting their hand on the stove. But before being overthrown, again, the Party of Regions rewarded Manafort for his efforts to the tune of $12.7 million in off-the-books payments, income Manafort neglected to report to the IRS because he A) didn’t feel like paying taxes, and B) didn’t feel like registering with FARA. So he hid the money in offshore bank accounts. Now it’s post 2014. Manafort has nearly a decade of experience working for Putin’s allies, assassins, and fascist politicians. He’s swimming in Russian oligarch cash and heavily leveraged, opening him up to blackmail. And the Kremlin knows he has a knack for rebranding criminals for successful runs for office. So where does Manafort go next? If you said “Cozy up to his decades-long pal Donald Trump’s presidential campaign,” congratulations, you’ve been following along at home. But not before first traveling to London to meet for a third time with Assange in March, 2016. Not long after, Manafort is brought onto Trump’s campaign as Chairman. Then in July 2016, he, Don Jr., and Jared Kushner all sit down with a known Russian intelligence asset promising damaging information on Hillary Clinton in the now infamous Trump Tower meeting. What happens next? Why Manafort is promoted to Campaign Manager of course. But it doesn’t end there. Not long after that meeting, Assange and Wikileaks dumped their stolen DNC emails, only the first of such dumps that would happen in 2016, the other coming not thirty minutes after Trump’s infamous Access Hollywood tape was released. Then, at the Republican National Convention, Trump’s foreign policy team, pushed hard from above by Manafort, gets the GOP to make a 180 degree turn on their platform’s position on Russia’s annexation of Crimea. Not only that, but the GOP completely walked back their previous support for arming and training the Ukraine military to fight “pro-Russian rebels” in the east (in reality, Russian special forces troops). These were among the strategic goals Manafort’s clients in the now-defunct Party of Regions and their patrons in the Kremlin had been working towards for years. Their $12 million man delivered at the Republican National Convention. That, friends and followers, is the straight-line between the charges Mueller convicted Manafort on, and the Trump campaign’s culpability in conspiracy with Russia. Mueller knows everything, and has for quite a long time now. 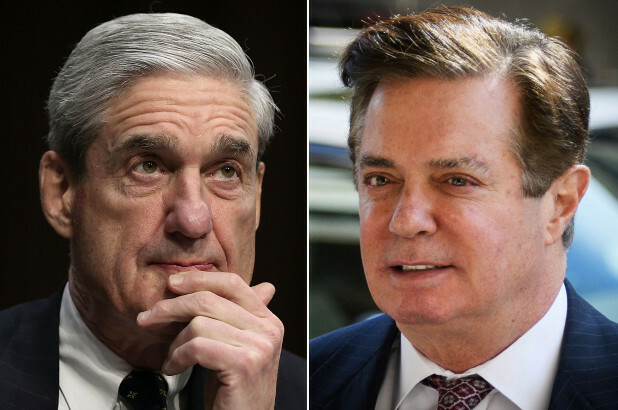 Several lawyers and former prosecutors have guessed that Mueller waited to file his accusations against Manafort for lying because he knew Manafort and Trump’s legal teams were coordinating their stories. Now that Mueller has Trump’s answers in writing, he’s got them both nailed for perjury and obstruction for telling the same lies. And the icing on the cake is it looks like Mueller is going to entirely bypass his illegitimate boss Acting AG Whitaker’s attempts to bury his report to the public by bringing the receipts into the same VA courthouse and lay them out as his evidence Manafort broke his plea deal, thus revealing his evidence against Trump at the same time. The end is near. Everything is coming together, and the pace is quickening. Oh, btw, Manafort picked Pence to be VP. Update, 11/28: Welp, turns out the assumption that Manafort and Trump’s legal teams were coordination is no longer an assumption. The NYT reported late yesterday that Manafort’s lawyers were indeed briefing Team Trump on everything Manafort was discussing with Mueller’s prosecutors. Which is deeply unethical, and quite possibly illegal. More witness tampering and obstruction, please! As always, if you like what I’m doing here, make sure to subscribe to my email newsletter in the blue box at the top of the page. And if you really like what I’m doing, preorder my next book, STARSHIP REPO. A guy that is paid millions to help other campaigns suddenly decides to work the trump campaign for free and nobody bats an eyelash? As you said, he’s completely over leveraged, but he can take time out to run a presidential campaign without taking a salary. I was pretty sure at that point he had an alternate agenda and trump in the White House was his way of paying his Russian handlers back.